I love to dance. At concerts, I find it hard to sit down. If I’m not standing, my feet are tapping and I’m groovin’ in my seat. When my kids were babies, they would be cranky in the evening, so I’d crank up the music and dance with them in my arms around the room. Now my daughter is 11 and she’s embarrassed any time I dance in public. I love watching young children dance, because they don’t care—they have no inhibitions. They’ll gyrate and do the goofiest moves, letting their little bodies move and groove to the music. As adults, sadly, we become more self-conscious of how we look when we dance. This week’s Happy Act is to dance. It’s the holiday party season so maybe you can cut a rug on the dance floor with your co-workers, check out a club, or busta move with your kids in your living room. It doesn’t matter, just dance. You’ll be smiling when the music stops. 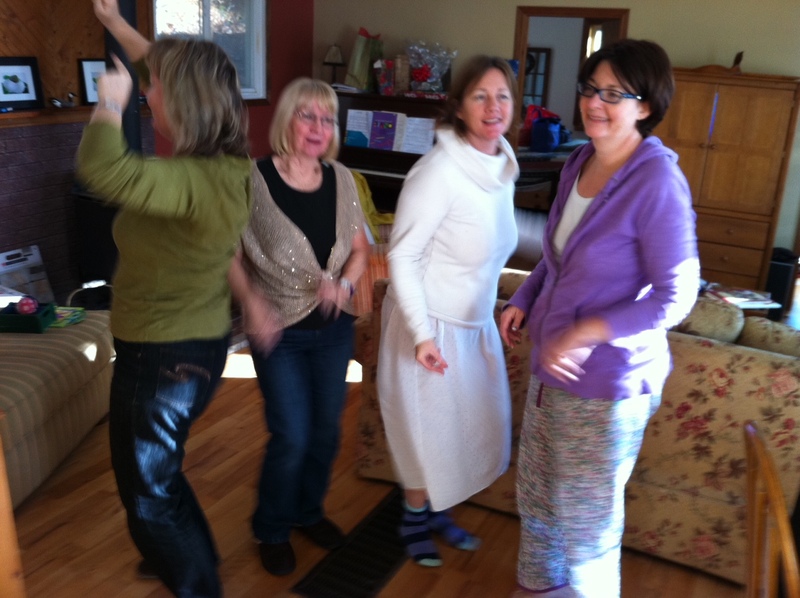 Here’s a picture of the gang staying at my house this weekend busting a move to David Wilcox in our jammies in my living room. To inspire you, check out this video of the 2012 Shag Dancing champions. But don’t try this at home kids, you might just bust a hip or a knee instead of a move. Hey Laurie; Way to go! I too love to dance an groove too! So now I have an excuse to dance an pop with Alyssa. She takes jazz an I am so jealous! I want to take something like that!! Look at those hot chicks!! First dancing; then hot tub!